How to Fix “Unable to install Printer" Error Code 0x00000c1 on Windows 10? 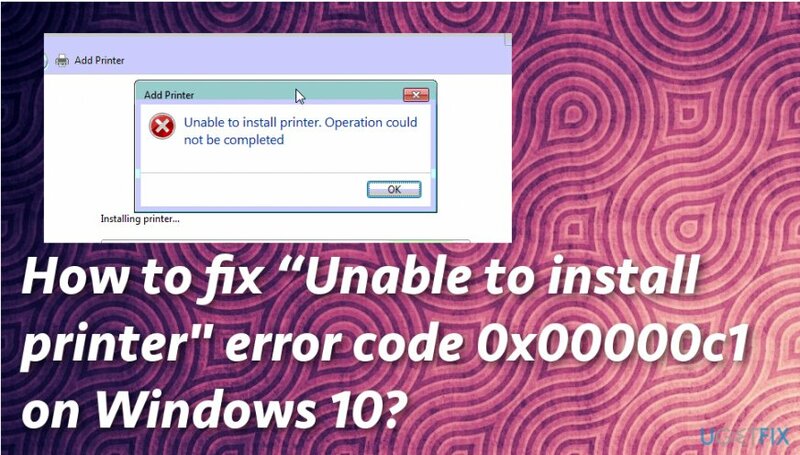 Home »	Fix » How to Fix “Unable to install Printer" Error Code 0x00000c1 on Windows 10? Issue: How to Fix “Unable to install Printer" Error Code 0x00000c1 on Windows 10? Hello, I’ve been trying to install a printer to my Windows 10 OS, on which, by the way, all available updates have been installed about a week ago. The system does not accept the printer and gives me an error code 0x00000c1. What does it mean? I can’t find any useful information on the net, so I would highly appreciate your help! The “Unable to install Printer. Operation could not be completed (error 0x00000c1)” error typically emerges during the installation of the printer. In some of the cases, it may be displayed when trying to use the printer for printing or scanning (if the printer has an inbuilt scanner). The problem arises after downloading the latest Windows OS upgrade or reinstalling Windows OS. Unfortunately, latest Windows 10 updates have severe issues, so updating for the latest bug-free OS version could fix problems, including 0x00000c1 error. Although the issue prevails on Windows 10 OS, it may also arise on Windows 7, 8, 8.1 or other versions, especially when a PC user rolls back to the older version of operating system from Windows 10. The culprit of this particular bug may be related to the printer driver or Print Spooler service. Nevertheless, sometimes people are not allowed to install printer due to some damaged system files or registry keys. Thus, we would recommend scanning the operating system with a professional optimization tool initially and only then perform the error 0x00000c1 fixes manually. Cleaning the system from cyber intruders could improve the performance of your device significantly because malware can alter files on the system, registry entries, and corrupt data. All this activity diminishes your time online and affects the speed of your computer. Also, “Unable to install printer” error code 0x00000c1 on Windows 10 may appear due to suspicious virus activity. The first step you should do when fixing “Unable to install printer” error code 0x00000c1 issue on your Windows device is a thorough system scan. You need to find out is there any issue that can be identified before any manual changes. For this purpose, Reimage would be a great option. Locate Print Spooler on the Name list and double-click it. When the Properties window opens, check the status of the Service. If it is stopped, click the Start button. Make sure that the Startup type is Automatic. For the fix to be executed, reboot the system. 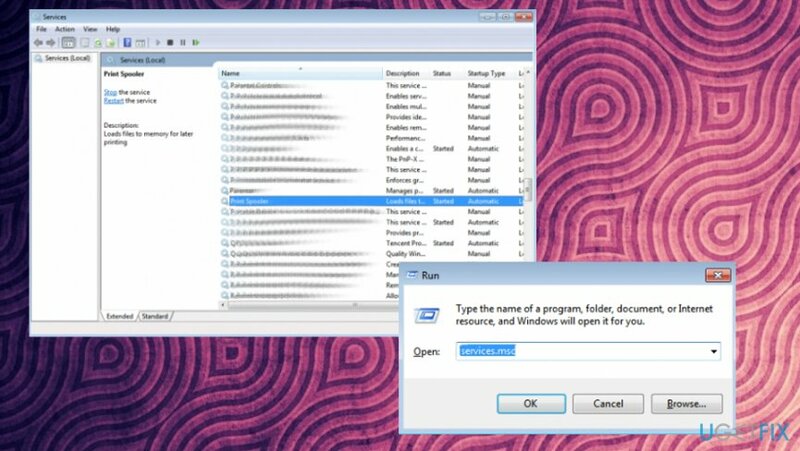 Since this method requires the removal of some registry entries, make sure to create registry backups in case you prevent damage in case of a failure. You can find information on how to backup registries here. 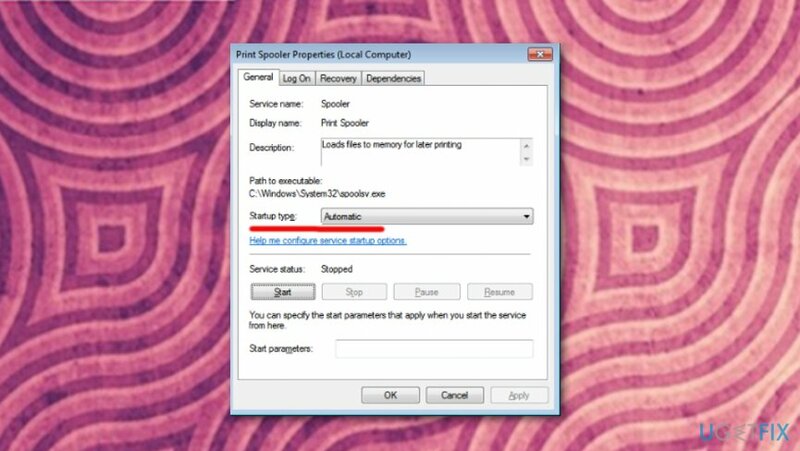 To start with, disable Print Spooler service. The steps are provided on the previous method, except that you have to Stop the process instead of Start. After that, open the C:\\Windows\\System32\\Spool\\Printers directory and delete its content. Then open C:\\Windows\\System32\\Spool\\Drivers\\w32x86 folder and delete files stored in it as well. Once done, press Windows key + R, type regedit, and press Enter/OK. HKEY_LOCAL_MACHINE\\SYSTEM\\CurrentControlSet\\Control\\Print\\Environments\\Windows NT x86\\Drivers\\Version-x (the number that stands for x varies on each computer) (32-bit system). HKEY_LOCAL_MACHINE\\SYSTEM\\CurrentControlSet\\Control\\Print\\Environments\\Windows x64\\Drivers\\Version-x (the number that stands for x varies on each computer) (64-bit system). Open this directory to see all printer registry entries. Select the file, right-click it, and select Delete. Repeat these steps with each printer registry entry. Then Start Print Spooler service and reboot the system. Find Printer Driver, right-click it, and select Update Driver Software. You can also try to reinstall the printer according to the instructions of the manufacturer or updating the driver and software manually. Maybe you need to repeat previously done steps to make sure they work. ^ Larry Dignan. Here's how Microsoft can fix its Windows 10 update issues. ZDNet. Technology news, analysis, comments and reviews. ^ Issue with printer operation. Techsupportall. Free technical help. ^ Walter Glenn. 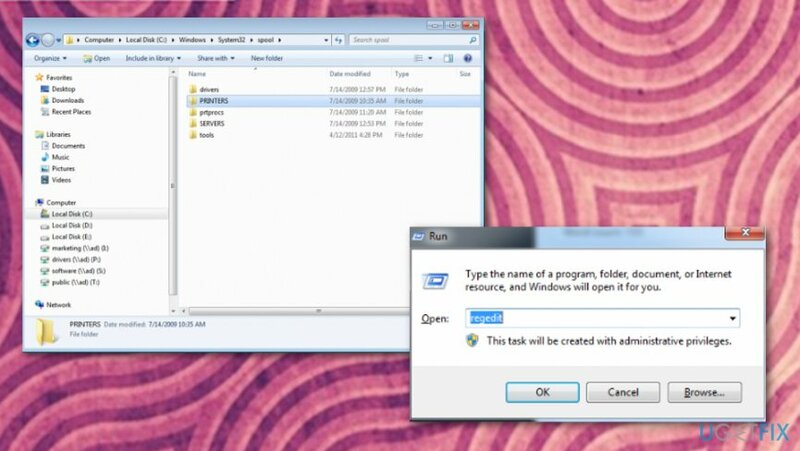 What is a corrupted file, and is there a way to get it back?. Howtogeek. We explain technology. Thanks for posting. Worked for me, This article is very helpful and using these steps I resolved the installation problem.